As we live in an older property, it can get a bit chilly in the winter months (in fact anytime from Autumn to Spring really). 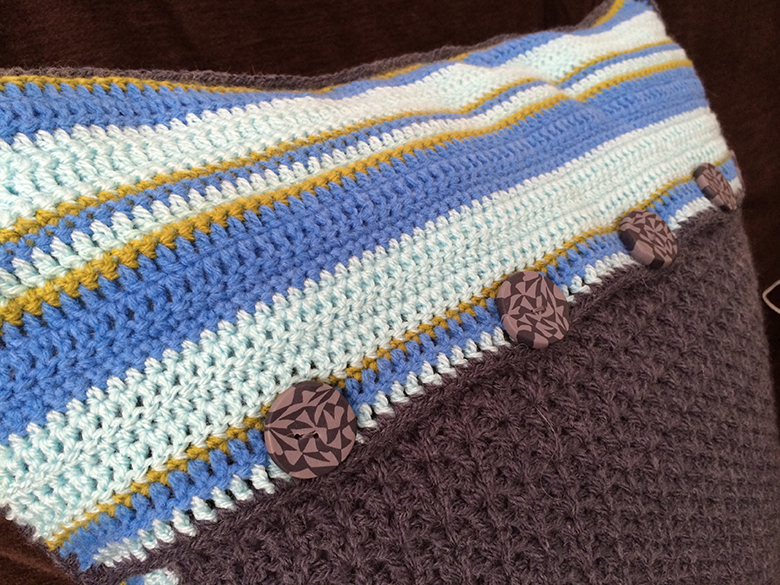 So the big project for 2014 was to make a large winter woolly blanket for our bed to keep the cold at bay. I’d seen this bobble stitch, which I really liked, and decided to use this to create a pattern. We have a king size bed and I wanted the blanket to hang over the edges, so having measured the bed I decided to make 36 squares measuring approx 35cm x 34cm each (ok, almost square…) in a 6×6 layout. 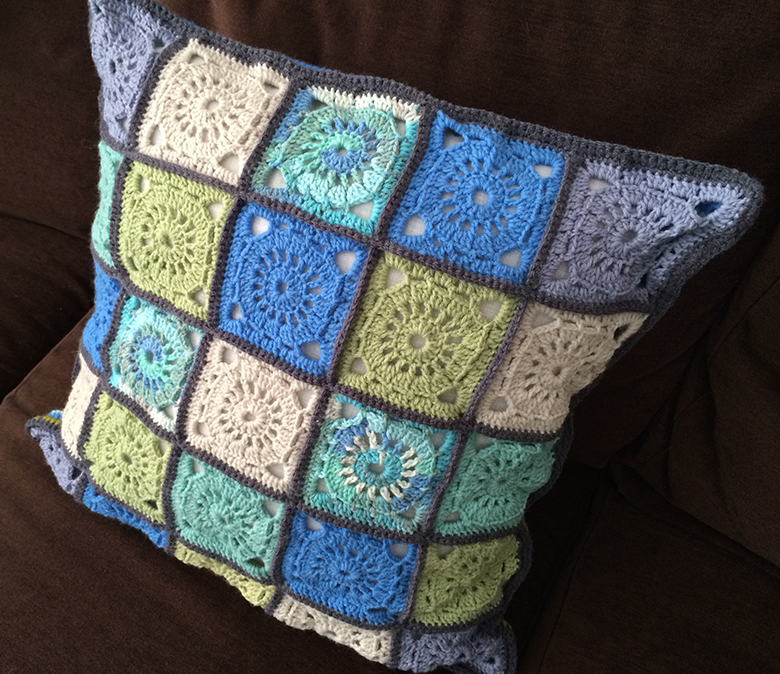 I wanted to use the same pattern stitch for each square and use several different colours. Making individual squares definitely made the project more manageable as opposed to creating one large piece (especially with a kitten trying to ‘help’!). Each 400g ball made up four squares. The chain row is a multiple of 4 plus 3 (I used 44 ch plus 3 ch). Row 2 – 2 dc, [1 bobble, 3 dc] repeat until last 3 stitches, 1 bobble, 2 dc. Row 3 – ch 3 (counts as first tr), tr in next st to end, ch 1, turn. 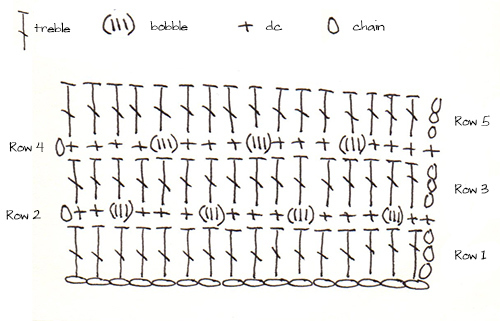 Row 4 – 4 dc, [1 bobble, 3 dc] repeat to end, 1 dc in last stitch. Row 5 – ch 3 (counts as first tr), tr in next st to end, ch 1, turn. Repeat rows 2-5 x 8 times (this will give you 9 rows with four bobbles and 8 rows with three bobbles), fasten off. 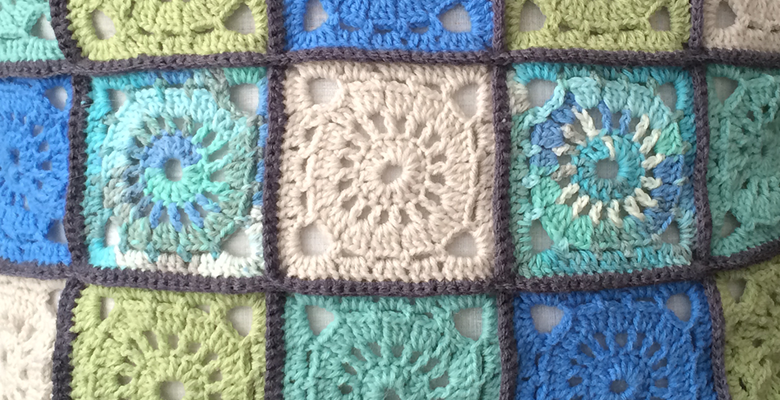 Once I had completed 36 squares I joined them together using a dc stitch in a contrasting cream colour. To finish off I created a simple border. I made this up as I went along but if I recall correctly I did one row of dc and one row of tr in cream, one row of dc in light grey and finally a row of htr in dark grey. I got a new iPhone earlier in the year and knowing how ‘fragile’ they can be, I bought a protective screen cover and case for it. Although this did help, I still managed to scratch the phone while it was in my bag, which I had carelessly thrown in with keys and various other objects. 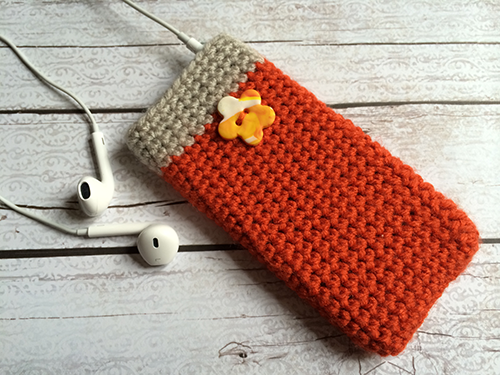 To prevent any further damage I set to work on creating a protective crochet sleeve. I knew how I wanted it to look like and started to create my own pattern. It did take several attempts to get the fit just right (using the Snow White approach: this one is too small…too large…ahh just right!). I then tried various colour combinations and also included a hole for the headphones on some. 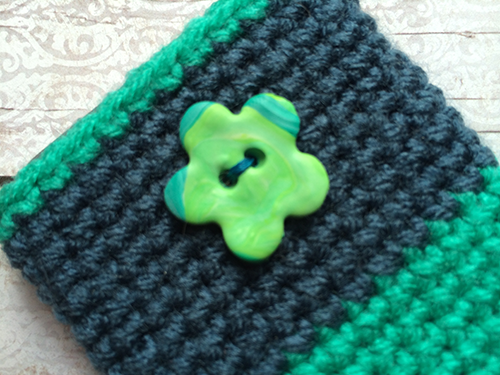 Finally, the finishing touch was to add one of my polymer clay buttons to the front, et voila! 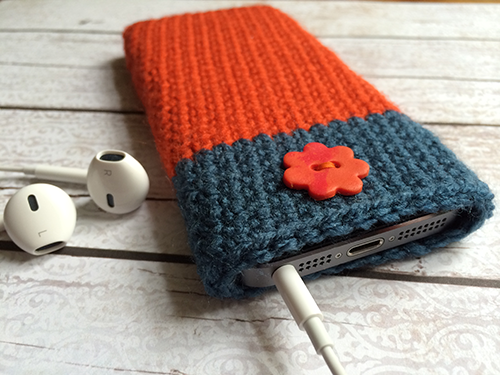 A smart, protective cover to keep my phone safe. If you do like these and would like one for yourself/gift they are available on my Etsy shop. 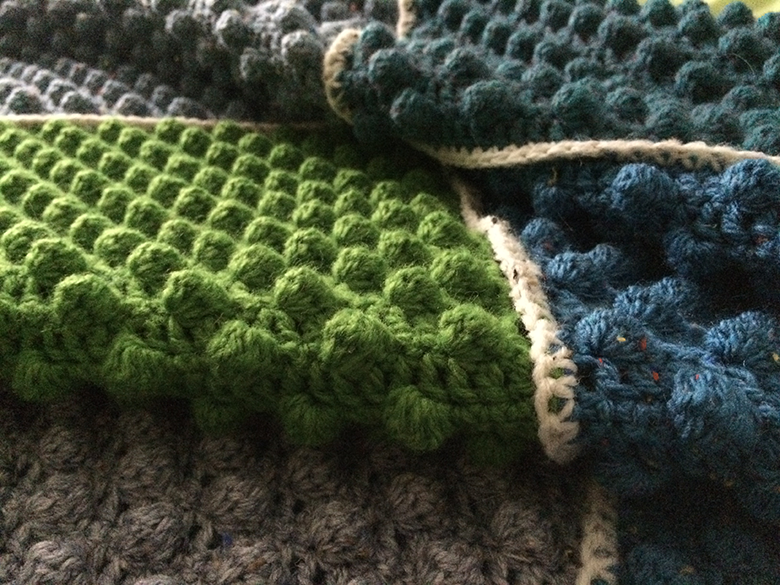 I’ve been looking for projects to use up my stash of leftover yarns. I really like making blocks as they are easy to carry around and fun to make. 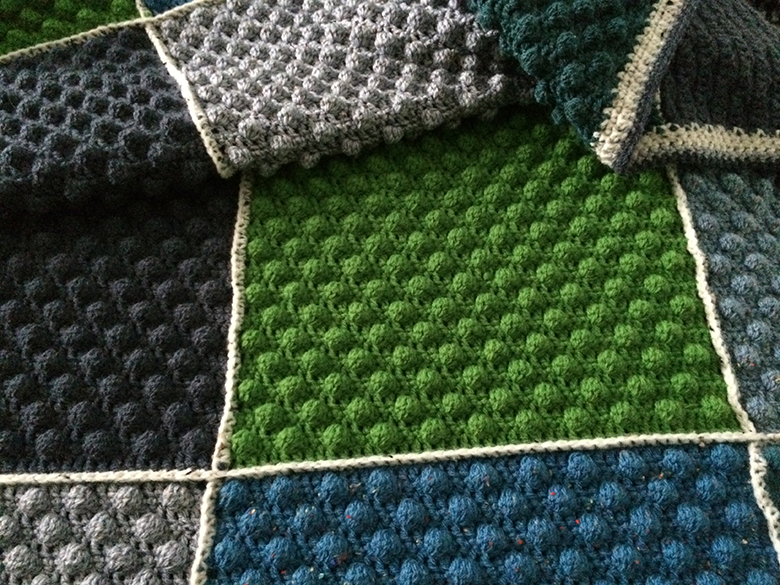 I found a pattern for a blanket made up of crochet blocks in Crochet Workshop by Erika Knight and used this as my starting point. 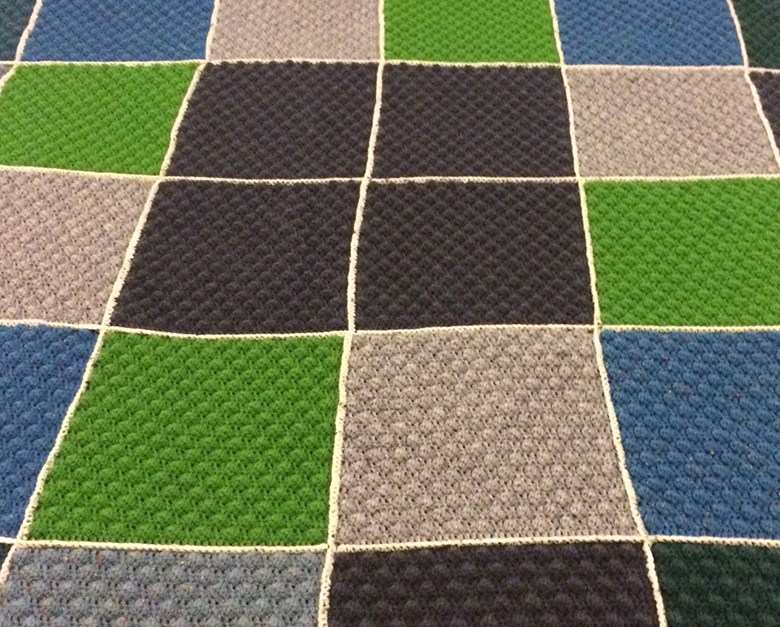 Using a colour palette of blues, greens and stone I made 25 squares, enough to make an 18″ cushion cover. 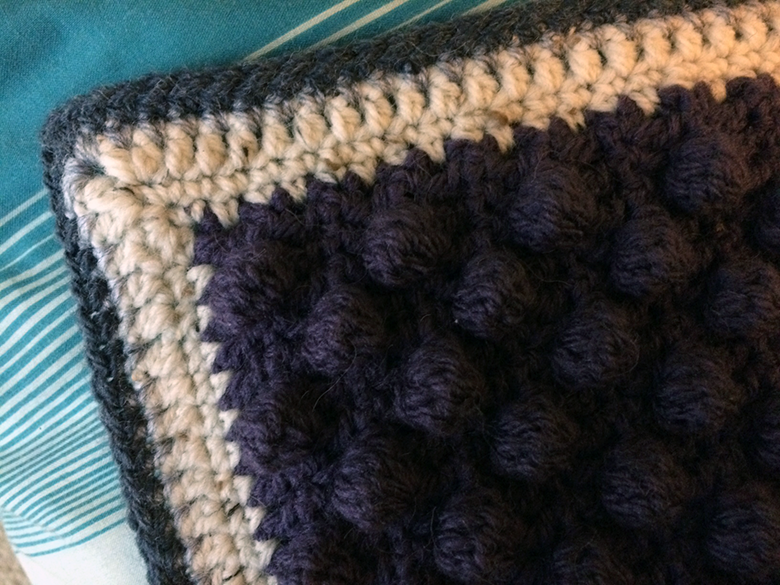 I joined the squares together using a contrasting dark grey yarn and DC crochet stitches. 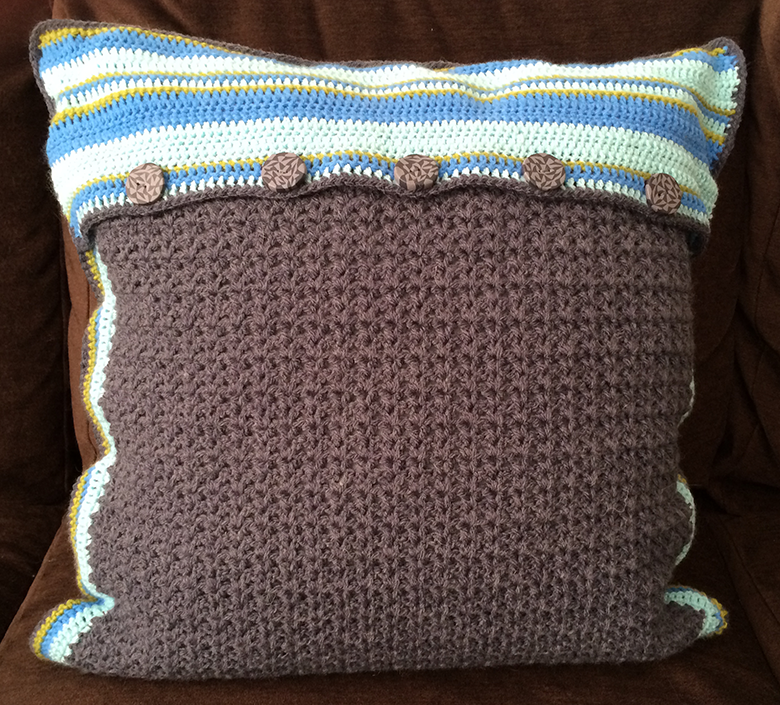 For the back of the cushion I used the grey yarn and a simple ‘V’ crochet stitch. I did run out of the grey wool part way through (and I hadn’t made it wide enough), so I used the colours on the front to make a striped edge and fold over top. I fastened the flap with five grey Fimo buttons that I found in my collection et voila!